While you're crossing the railway tracks to enter the small, residential neighbourhood of MS Maqtha, Hyderabad, you don't really anticipate or stay prepared for what you're going to witness beyond. Apparently, it's nothing special; nothing apart from a congested network of narrow alleys, shabby, roadside tea stalls and modest, curtained homes. But hold on! Don't get dispirited by the shabbiness of the place. 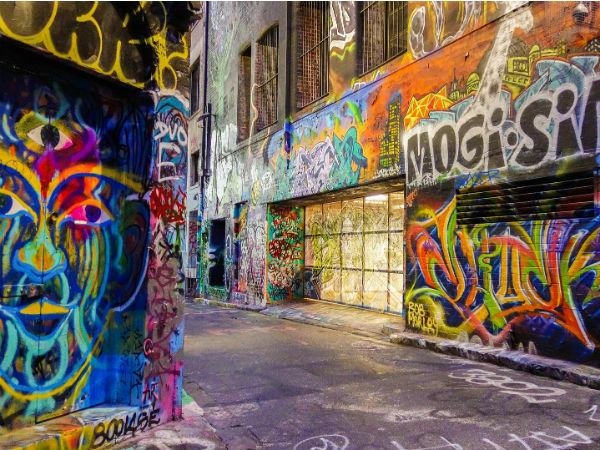 What lies inside of that is a vibrant world full of energy-a place brilliantly adorned by colourful street art murals. And some of them even stretch across entire buildings which are four to five storeys high. At the entrance of Maqtha Art District (as it's called now) is a black-and-white signage that introduces you to the art district. But it doesn't really prepare you for the riot of colours that lies ahead. A green wall leads to a yellow lane, and another turn takes you to the region's blue square. What's even more beautiful is that all of these are housed within one of the city's most rundown areas. Areas where sewage flows on the street, overhanging wires are the norm and young boys zip around as if life is a motocross race. Maqtha Art Village seems to be straight out of fables; like someone picked up a handful of abandoned canvases and painted them with heartfelt colours and patterns. Until 2016, the streets of Maqtha literally had no names and people would identify their houses or where they were merely based on the shops. But now the streets have got their own identities and are easily navigable. Thanks to the bunch of passionate artists who decided on creating a navigation system based on colours. Now, each street of a colour-coded Maqtha has been designated a particular colour that artists can use to give shapes to their imaginations. So there stands a green gully, a boulevard of blue, a red road and a pink pathway. It's these green, pink, yellow and turquoise gullies of Maqtha that, in no time, have become landmarks for the residents. So much so that the area has been swarming with photographers and artists ever since the concept of an "art district" came into being. Needless to say, art, here, has created a very warm atmosphere out of a sleepy, messy ghetto. Keeping pace, people of Maqtha, who used to be sceptical at the beginning, have become extremely helpful and supportive. Now many of these art organisations are even organising workshops with them and in the public school of Maqtha. Do you know what came out as a direct result of interacting with the inhabitants? Their stories and desires gave birth to the inspiration behind many of the art pieces you get to see at Maqtha. By Air: From Rajiv Gandhi International Airport, you can take direct buses or cabs to Khairatabad near Hussain Sagar and then board an auto to reach Maqtha Art District. By Train: The nearest and safest railway station is Secunderabad Junction, from where you can again take a bus or cab for Khairatabad. From there, an auto will take you to Maqtha. Once you're at Maqtha, cross the railway tracks and follow the main road to its end and you'll find the murals. The first section begins at the end of this road to your left. From there, just follow the arts and arrows. It's the world's only wacky car museum featuring vehicles in the shapes of toilets, hamburgers and Ganesha just to name a few. It's the brainchild of Sudhakar Yadav, for whom bizarre cars are a lifelong obsession. Starting to re-engineer junk bikes as a teenager, he opened this museum in 2010 to showcase his designs. The place turning into one of the most popular (and unusual) tourist destinations of the city was just a matter of time. Today, some of his cars hold world records such as the world's smallest double-decker bus with a capacity of just 10 riders. Every year, thousands of pilgrims throng to a small temple in the village of Chilkur to ask for US visas. Yes, you heard that right! And not only visas, visitors of Chilkur Balaji Temple (more commonly known as Visa Balaji Temple) also ask for spouses, children, properties and even government jobs. So, to all the ambitious young people looking for F-1 (student) and H-1B (skilled employment) visas to the US, right there sits a temple with a reputation for granting your wishes. After all these, it's indeed difficult to resist describing Hyderabad as a place where tradition meets globalisation.